Berkshire Hathaway reported financial results for 2011 over the weekend which included Warren Buffett’s annual letter to shareholders. The most common Berkshire headline on various websites, such as this article by Bloomberg, refers to Berkshire’s 30 percent decline in fourth quarter net income. Given the short attention span and investment horizon on Wall Street, financial journalists understandably seek attention by emphasizing the metric that most readers are looking for. Unfortunately, net income for a single quarter or even a full year is usually meaningless for Berkshire Hathaway where results must be examined over a very long time horizon to convey any meaningful information. Many value oriented websites such as Guru Focus are taking a close look at 2011 results and focusing on some of the key points that matter when it comes to evaluating Berkshire’s business performance. Rather than writing about the specifics of Berkshire’s performance in 2011, we find it more useful to step back and assess Berkshire’s performance over a much longer time frame – a full decade. While many investors will debate whether one, three, or five years should be considered “long term”, very few would claim that a full decade doesn’t qualify as a long term horizon. 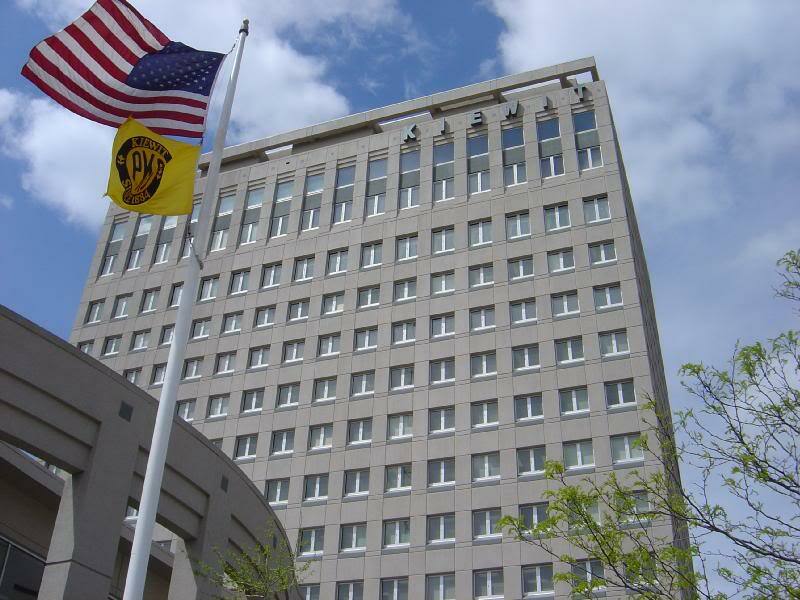 To illustrate the experience of a ten-year shareholder, we will examine the fictional story of Jane, a Berkshire shareholder who bought her shares on December 31, 2001 and is now assessing how Berkshire has performed over her ten years of ownership and trying to evaluate prospects for the next decade. In the fall of 2001, Jane was shocked to receive a certified letter from an attorney informing her of a $750,000 inheritance from a distant relative she only vaguely recalled from her childhood. The relative had died in early 2001 and had left no will. The probate process finally identified Jane as the sole living heir and she received the funds in October 2001. Jane was 45 years old at the time, had two years of college education, earned the median wage at a very secure job, and owned a median priced home in Omaha, her lifelong home town. Although Jane’s only debt was a modest mortgage on her home due to be paid off in twenty years, she had no meaningful savings outside of a small emergency fund and no background or experience investing significant sums of money. Mysteriously, helpful sounding financial planners and brokers starting calling Jane almost immediately after the close of probate. However, after meeting a few of these planners, Jane felt more confused than before regarding how to invest her windfall. Fortunately, Jane had attended Berkshire Hathaway’s annual meeting the prior spring with a friend who owned shares of Berkshire. Several comments made by Warren Buffett and Charlie Munger seemed to cast doubts on the wisdom of entrusting money to financial “helpers”. Impressed by Warren Buffett’s statements at the annual meeting and after reviewing the past few years of shareholder letters, on December 31, 2001 Jane decided to purchase 10 Class A shares for $75,600 each, a total investment of $756,000. Jane’s time frame for holding her shares was indefinite, although she hoped that the funds would appreciate significantly over the next twenty years to provide a source of funds during her retirement which would begin in 2022. Berkshire’s stock price has fluctuated significantly over the years, particularly since the financial crisis of 2008-2009. For the ten year period from December 31, 2001 to December 30, 2011, Berkshire appreciated from $75,600 to $114,755 for a total return of 51.8 percent, or 4.26 percent annualized. Over the same period, a popular exchange traded fund tracking the S&P 500 (SPY) rose from $114.30 to $125.50 while paying $21.88 in dividends representing a total return of 28.9 percent, or 2.57 percent annualized. Although Jane is pleased that Berkshire has outpaced the S&P 500 index fund and has provided a return in excess of inflation over her period of ownership, she can’t help but feel somewhat underwhelmed by the performance of her investment and feels mentally anchored to the $150,000/share price that Berkshire briefly reached in late 2007. However, Warren Buffett’s latest shareholder letter clearly signals that he believes Berkshire’s intrinsic value is materially higher than the current stock price. Given that Jane is at roughly the half way point in her likely two decade ownership of Berkshire, she decided to dig a bit deeper by looking at the performance of the business rather than focusing only on the stock price. Our Board of Directors has authorized Berkshire Hathaway to repurchase Class A and Class B shares of Berkshire at prices no higher than a 10% premium over the then-current book value of the shares. In the opinion of our Board and management, the underlying businesses of Berkshire are worth considerably more than this amount, though any such estimate is necessarily imprecise. If we are correct in our opinion, repurchases will enhance the per-share intrinsic value of Berkshire shares, benefiting shareholders who retain their interest. In Mr. Buffett’s letter to shareholders, he explicitly addresses the question of Berkshire’s intrinsic value relative to book value for each of Berkshire’s major business segments. While shareholders are not provided any specific figures, with a couple of minor exceptions it is clear that Mr. Buffett strongly believes that the intrinsic value of each of Berkshire’s important business groups is far higher than 110 percent of book value. The following chart replicates the stock price chart shown above but also includes Berkshire’s latest reported book value for each quarter over the ten year period. We can see that the ratio of Berkshire’s price to book value per share fluctuates significantly over time. Here we can see that Berkshire’s price/book ratio was nearly 2.0 at the time of Jane’s initial purchase and fluctuated between 1.4 and 2.0 for most of the first seven years of the investment period. However, after the onset of the financial crisis, Berkshire’s price/book ratio dropped into a lower range of between 1.0 and 1.5. 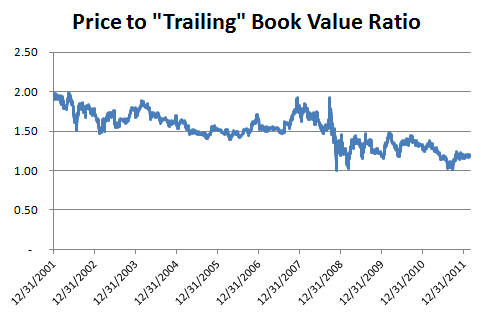 At year-end 2011, the price/book ratio was 1.15 and has since increased to 1.20. 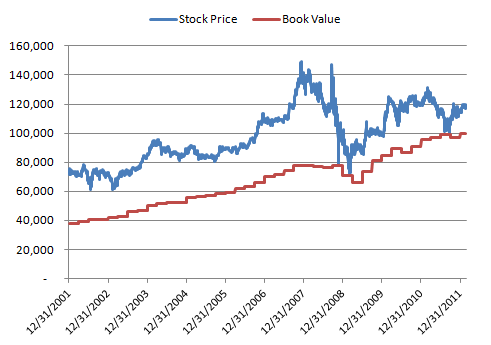 Berkshire’s book value per share was $37,920 on December 31, 2001 and rose to $99,860 as of December 31, 2011. This represents a 163 percent increase, or 10.2 percent on an annualized basis. It is clear that Berkshire’s book value has significantly outperformed the company’s stock price over the ten year holding period of Jane’s investment. If Berkshire’s price/book ratio on December 31, 2011 had held at the nearly 2.0 level that prevailed at the time of Jane’s purchase on December 31, 2001, Berkshire’s stock price would have been nearly $200,000 per share and the performance of Jane’s investment would have been exactly the same as the advance in book value: approximately 10.2 percent annualized. If Berkshire’s price/book ratio on December 31, 2011 had been approximately 1.5, the average price/book ratio since 2000, Berkshire’s stock price would have been nearly $150,000 per share and Jane would have achieved a 7.1 percent annualized return. The relatively disappointing performance of Jane’s investment is not attributable to poor business performance at Berkshire but due to the compression in the multiple of book value that the market has assigned to Berkshire’s shares. Shareholders’ Equity increased from $58 billion to $164.9 billion. Shares outstanding increased from 1.528 million to 1.651 million resulting in book value per share advancing from $37,920 to $99,860. 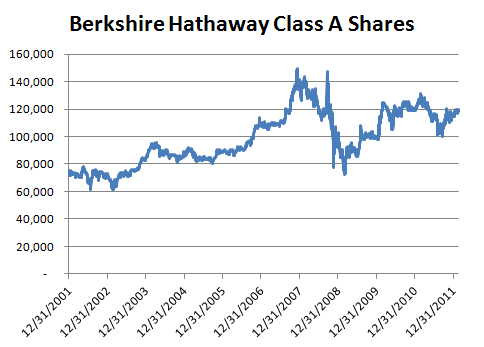 Most of the share count dilution can be attributed to Berkshire’s acquisition of BNSF in early 2010. Cumulative net income of $88.8 billion. Although annual results were uneven, Berkshire posted significant net income over the ten year period. Net income ranged from a low of $4.3 billion in 2002 to a high of $13.2 billion in 2007. Berkshire’s net income can be heavily influenced by insurance results and the timing of realized capital gains and losses and are generally meaningless over short periods such as a quarter or a year. However, a full decade begins to reveal Berkshire’s formidable earnings power. Cumulative Free Cash Flow of $84.1 billion. Free cash flow is calculated by taking the total net cash flows from operations and subtracting capital expenditures. Berkshire spent $51.1 billion of cash for acquisitions. 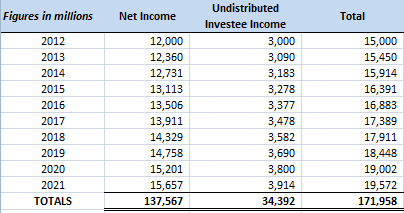 The majority of Berkshire’s free cash flow was devoted to purchasing wholly owned subsidiaries. This figure does not include stock issued in connection with acquisitions. It is notable that Berkshire spent nearly as much cash on acquisitions over the decade as the company held in shareholders equity on December 31, 2001. Berkshire’s Insurance operations posted underwriting profits in all years except 2002. As Warren Buffett points out in his shareholder letter, Berkshire’s insurance businesses are unusual. The insurance industry as a whole tends to post underwriting losses on average. Insurance Float grew from $35.5 billion to $70.6 billion. Insurance float represents liabilities earmarked to pay the claims of policy holders but available for Berkshire to invest. The presence of cost free float has enabled Berkshire to generate investment returns over long periods of time using “other people’s money” without the negative qualities of using traditional leverage. While these bullet points merely provide a 30,000 foot view of Berkshire’s progress over the past decade, we can begin to get a sense of how Berkshire has managed to compound book value per share at a rate in excess of 10 percent while starting from a very large base of capital. It seems very clear that Berkshire is a vastly more valuable enterprise today than it was when Jane made her investment ten years ago. Furthermore, while we are not providing a specific valuation in this article, the qualities of the business appears to support Mr. Buffett’s assertion that the business is worth more than book value. Getting back to Jane’s story, we recall that her investment time frame was for twenty years which means that she is only at the half way mark in her ownership of Berkshire Hathaway. Jane’s original investment of $756,000 has appreciated to $1.2 million, a compound annual return of 4.6 percent. Jane could sell her shares at the current price but would owe taxes on her $444,000 gain. After paying federal and Nebraska taxes at a combined rate of about 21.7%, she would be left with slightly over $1.1 million to reinvest for the next ten years. Alternatively, Jane could retain her Berkshire holdings and defer taxes on her gains for another decade, but she has to be convinced that Berkshire’s prospects going forward are acceptable. There are many valuation approaches analysts have used to estimate Berkshire Hathaway’s intrinsic value, many of which have been discussed on this site in the past. However, for purposes of addressing Jane’s decision, we will approach the problem in a very simple manner in an attempt to estimate a ballpark price level for Berkshire in ten years. Since Berkshire does not pay a dividend and has not repurchased a material number of shares, we assume that the aggregate net income will be added to retained earnings over the ten year period. Assuming that the undistributed investee income, on average, shows up in appreciation of the equity securities held, the aggregate figure will be accretive to Berkshire’s equity either via net income if investments are sold or through other comprehensive income if the investments are held. The table below calculates a projection of Berkshire’s share price in ten years based on the assumption that the earnings are retained and the share count remains the same. Our assumption of 3 percent growth in normalized earnings power implicitly assumes that Berkshire will not find attractive places to invest the significant cash generated by businesses owned today. Instead, the assumption, which is arguably unrealistic, is that cash languishes on Berkshire’s balance sheet rather than being distributed to shareholders or invested in new businesses. If these assumptions hold, book value per share in ten years would approximately double from today’s level to $204,000. We assign a price/book ratio of 1.4 at the end of the ten year period to arrive at a price projection of approximately $286,000. This is below the average price/book ratio that has prevailed since 2000 but above the typical price/book ratio since the financial crisis. If we instead assume that the price/book ratio will remain unchanged at today’s level of 1.2, the price projection would be approximately $245,000. From today’s stock price of $120,000, Jane might expect annualized returns of between 7 to 9 percent using the assumptions provided above and depending on the terminal price/book ratio that is used. Keeping in mind the fact that the assumptions used here “bake in” the lack of meaningful reinvestment opportunities, book value could very well be materially higher that our estimate in ten years. For example, if Berkshire achieves the same 10.2 percent annualized rate of increase over the next ten years that it achieved over the past ten years, book value would be $264,000 in ten years and a price/book ratio of 1.4 would yield a stock price of $370,000 which would represent a 11.9 percent annualized return from the current stock price. With the benefit of perfect hindsight, Jane would have been wise to avoid paying nearly twice book value for Berkshire shares at the end of 2001, a valuation level that has not been achieved since that time. As a result of buying at a high valuation, Jane’s results have significantly trailed Berkshire’s business results over her period of ownership. However, this is “water under the bridge” and all that matters today is whether Berkshire’s performance going forward justifies continued ownership of the shares. It appears that Berkshire’s book value progress over the next decade is likely to be very satisfactory even if it does not match the results of the past ten years. Furthermore, if Warren Buffett’s assessment of Berkshire’s current undervaluation is correct, Jane may expect to see expansion in the price/book ratio over the next decade which would further enhance returns. As a final consideration, Jane can benefit from continued deferral of the tax liability on her capital gains if she holds Berkshire rather than selling and looking for a new investment. If the assumptions in the table above prove to be in the ballpark, Jane might conservatively expect to own Berkshire shares worth $2.8 million in a decade which would represent a 6.8 percent annualized rate of return from her $756,000 purchase ten years ago. This would trail Berkshire’s progress in book value unless Berkshire trades at the unlikely valuation of 2 times book value in the future. However, very long holding periods tend to lessen the pain of mistakes provided that the business in question is compounding intrinsic value at a satisfactory rate. In the case of Berkshire, the overwhelming evidence is that this will be the case going forward. Disclosure: Individuals associated with The Rational Walk LLC own shares of Berkshire Hathaway. This article is not investment advice and involves a fictional character rather than a real individual.